If you ask an unprofessional and inexperienced person that how many monitors you need to trade, he can easily mislead you and make you waste a lot of money on this. I have seen this very frequently that when someone decides to trade, the first thing he does is spending several thousands of dollars to buy several monitors with a strong graphic card, or setting up a multi-monitor trading desk. Of course, they can not be blamed, because they are just misled by others. They think in order to trade professionally, having multiple monitors is a must, but this is not true. It doesn’t matter how many stocks or currencies you follow. All you need is just a 17″ wide screen laptop, or a desk computer with just one reasonably big enough monitor. 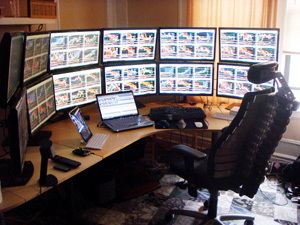 Having several monitors doesn’t help at all, and it can not make you a profitable trader. Don’t waste any money on these things. 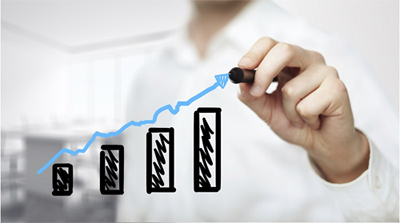 Almost all of trading platforms can handle several charts and tile them in different ways. Whenever you want to check a chart, you can maximize it, zoom in and out, and then minimize it and check another chart. Multiple monitors can help day traders. However, if you are a LuckScout user, then you know that we are strongly against day trading, because we believe that it is a big mistake, and it doesn’t make any money in long and short term. I personally have a laptop that I can take anywhere I go, and I check the markets through it without any problems. I strongly believe that your work environment has to be beautiful and pleasant, but it doesn’t mean that you have to spend a lot of money on it. The only problem of using a laptop is that you have to bend your neck to look at the laptop monitor and this will create neck pain after a while. This problem can be easily resolve with buying one extra desk monitor, placing it on the desk, and connecting it to your laptop. Then you have to place something under the monitor to bring it a little higher, the way that the top of the screen to be level with your eyes or even higher. You can use this monitor when you are going to check the charts or sit at the computer for a longer time. If you do so, you will never experience any neck pain. Of course, as we trade the long time frames, it doesn’t take us more than 30 minutes per day to check the charts, however sometimes you will have to sit at the computer for a little longer, and having an extra monitor and using it the way I explained is a big help. The conclusion is that you don’t need multiple monitors to trade. It doesn’t help you. Keep the work dead simple and you will get better results. The number of monitors doesn’t have any role in your trading business. 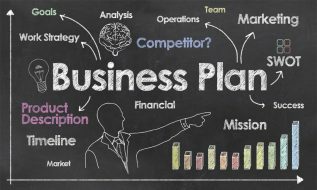 The too important factor is having the proper knowledge and experience, or as I say almost every day, starting from the right place and following the right track. A disciplined, knowledgeable and experienced trader can easily make money with a simple $500 laptop, but when you don’t have the knowledge and experience and you don’t follow the right track, then having the most expensive computers and equipment cannot help. It can even make you lose more, because it makes the work more complicated, and complication in trading has no result but failure and loss. Instead of being worried about the things that have no role in your success, focus on the factors that make you successful. Start from the right place and follow the right track. Last month i tripled my demo account but i risk 15%-20% of my initial capital. Is it possible taking same risk on real account? With a true ECN/STP broker that doesn’t bother to reach your account to stop out level by increasing the spread of the short positions, or lowering the leverage, yes technically it is possible to take such a risk with a live account. However, are you really going to do that? Thank for your reply. I’m still not pass all the learning stages yet. Surely I will not going to do it on real account. Just wanted to know how the pros managing their risk. You did wrote that pros taking risk more then 2%. I thk you missed an article by Mr.which mentions about demo trading. You got to treat it like a real live account. 15-20% risk is possible on demo without fear coz it isnt of any value to you. But in real account there will be too much fear involved. Dont let greed overwhelm you as well. All e best buddy. As for me, I have been trading my demo account with this strong patterns strategy for almost 2 months. And I am in 18-19% profit by now, although I risked only 1% per position, and even made some mistakes initially, and also didn’t take all the setups. I am actually satisfied with this result because (1) it is much much more than I can achieve with any “traditional” investments, (2) if I can keep this up in the long term, then I can turn a small amount of money into a big enough wealth. I just have to be patient. That’s the key IMO. hi otto, you are right. i am still a novice trader and what i did was pure greed. i should only risk 2% as advised. My R:R was 1:3 or 1:4 with the candlestick system, and 1:2 with DBB. Kamal, What you are doing is developing a BAD HABIT! REMEMBER This Is Not A Get Rich Quick Trade. I have been studying now for about 18 months. I treat this like a profession that I’m going to college to learn. One thing I know that what-ever you do in your demo account you will do in your live one. Please remember that Equity Management is very important to you and your account survival. Thanks for your tip, I absolutely agree. Thank God I haven’t bought any until now. I have just a quite good HP 19″ Laptop which I acquired with 600EUR and I am happy with it and the fact that I stumbled on your website. Regarding the neck/back pain I would recommend to anyone out there to invest in a height-adjustable desk table. You can sit down or stand up when you desire and the neck/back pain will be gone. I have bought a second-hand one with 320EUR (a new one of this type would have costet me way above 1000EUR) and I am very satisfied with it. It’s electronically adjustable and quite big (180×90). Respect to you and your followers! Thank you for your input on this subject. I’m also one of those that had the stupid idea that maybe multiple monitors are a must. 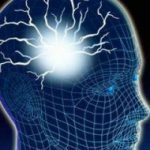 Of course, at the time I thought that day trading was the way to go but ever since I started following you on your website, my brain has been rewired… Eureka!!! Your work is truly appreciated! I regret to say we don’t recommend any broker on this site. It is not too hard to find good and reliable ECN/STP brokers. Will we be profitable long term trader if we only use the DBB strategy? Yes. But I recommend you to use both systems along with each other. Specially the way that the first system supports the second one. DBB system has a good success rate, but sometimes it has more losing setups under some special markets condition. But our “candlestick patterns + Bollinger Bands” system works good under any market condition. I used to trade on ipad but lately I trade using MT4 platform on my iphone. I am unable to trade all 19 pairs which you guys mentioned. Only 14 of them are available for the MT4 apps. Thanks for helping us in shortening our trading path! Thanks , for once again giving clarity about not having to have numerous monitors to read.